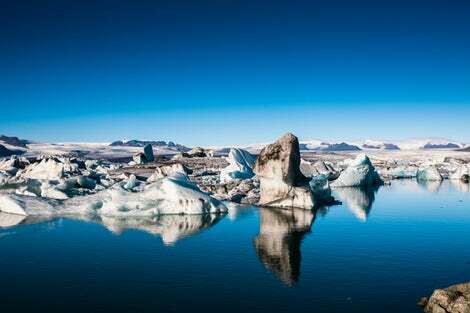 Run in conjunction with some of our partner companies here in Iceland our ‘fjords and into the glacier’ tour is a great choice for people who want to really dive into the nature of Iceland. By journeying into a series of man made tunnels inside the Langjökull glacier we are able to offer you a unique experience all throughout the year. You will be able to learn about how glaciers form, what they can teach us and what threats they face from global warming. Getting to the top of a glacier is easier said than done however and this is why we employ the use of specially modified vehicles in order to get you up from the base of the glacier in Húsafell to the peak! When the tour of the glacial caves is over we will bring you back to the city but not before making sure to check out some of the other local nature hotspots on the way such as the Hraunfossar waterfall and the Deildartunguhver hot spring. Húsafell is a large area of church and farm land that has seen a recent growth in popularity as a central hub for a number of tourist activities. Thanks to its close location to a number of areas of natural beauty many people chose this area to build their summer homes and following this came camping sites and holiday lets. The town boasts a swimming pool, a golf course and a number of lakes frequented by fishermen. 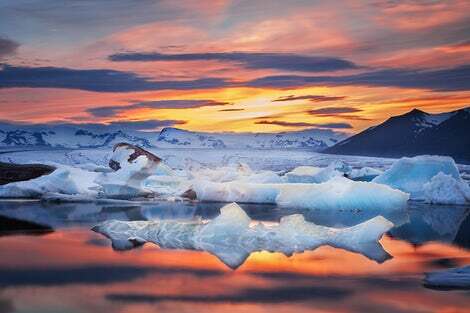 As mentioned your destination, the Langjökull glacier, is the second largest glacier in Iceland. Its name translates to “The long glacier” and while it does not directly feed many rivers, as other glaciers do, it is believed that a series of underground streams lead from the glacier. These streams are reported as being the origin point for a fair number of lakes and hot springs in the surrounding area. 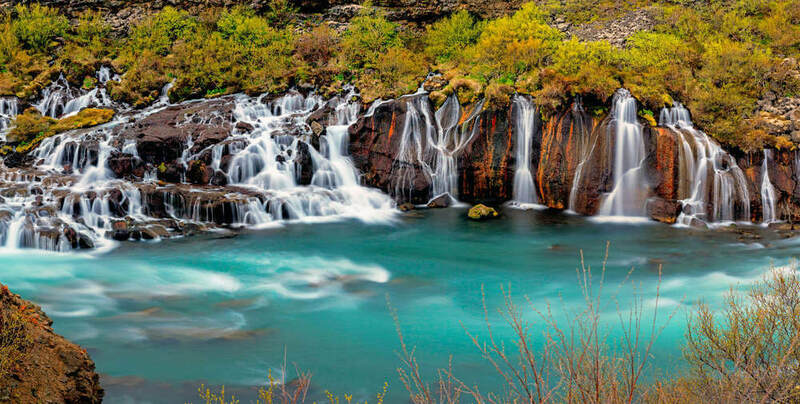 Hraunfossar is a series of waterfalls that stretch over 900 metres that originate from Hallmundarhraun. Hallmundarhraun is a lava field that was created by lava flowing from an eruption underneath the Langjökull glacier. The water from these waterfalls feeds the white river, a river which ultimately leads to the mighty gullfoss waterfall. Deildartunguhver is known as the fastest flowing hot spring in the whole of Europe. Traveling at a speed of 180 litres a second the warm waters of this hot spring are piped to the nearby towns of Borgarnes and Akranes for heating. Another claim to fame that this geothermal area has is that it is home to a special type of fern known as the “deer fern” which does not grow anywhere else in Iceland. Make sure to note down your pickup times and Departure Times. Pick up can take up to 30 minutes starting from the time on your ticket. 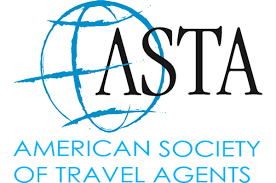 Please wait at your hotel / guest house in this time span. We collect our guests with several minibuses, so please be aware that you may need to change busses at a meeting point before the tour begins! Please note, children under the age of 8 are not permitted on this tour. Our day tour will begin with our fast and efficient pick up service. We will come with our fantastic bus fleet to collect you from either, one of the hotels in the center of Reykjavik or from one of the many pick up spots dotted across the city. Once all of our guests have been collected we will begin our onward journey to the mighty Langjökull glacier. One does not simply drive to the top of a glacier however, so we will have to begin our day by instead driving up to the town of Húsafell. Once we are here we can move you into a specially modified vehicle that is custom designed for tackling the task ahead. When you are safely inside the specialised truck you will be taken from the familiar surroundings of civilisation to a winter wonderland at the top of the glacier. From here you will be able to journey into the heart of the glacier via a series of man made tunnels. You can take some time to absorb the alien beauty of this environment whilst also learning about how these natural phenomena come to be and perhaps why it may not be around for much longer. When our time exploring the ice caves comes to an end we will take you back down to the town of Húsafell to rejoin the tour bus and head home again. The adventure doesn’t end there though as there is more nature to see. We will make some stops at the Deildartunguhver hot springs as well as the Hraunfossar waterfall. Please bring warm clothing and something waterproof to wear and good walking shoes.